Every referee wants that precious piece of jewelry. NEW YORK — They do it for the ring. Guys work their butts off their entire careers to get to this stage — the pinnacle of the professional football world — and many never make it this far. It’s Seattle vs. Denver for the NFL championship. All of the discussion here and everywhere else this week is about those teams — and rightly so — an unbelievable matchup with Denver and Seattle. It’s the No. 1-ranked offense going up against the No. 1 ranked defense. It’s a match made in heaven. But I’m not talking about those teams. I’m talking about the third team here — the team of officials. They will be under scrutiny unlike anything they’ve experienced all year. And considering it hasn’t been the best season for NFL officiating, the heat they’ll feel will be the only thing that’s warm here this week. There is so much riding on the league during this game in terms of the officiating. If the officials have a good game, then people won’t talk about it during the entire offseason because the last impression left in people’s minds will be a positive one. And the league is certainly hoping for that. This officiating crew, led by Terry McAulay, who is officiating his third Super Bowl, have not worked since the Division Championship round, so when they step onto the field Sunday, it will be their first game in three weeks. At no other point during the season do the officials get a break like that. McAulay previously refereed Super Bowls XXXIX and XLIII and has also worked six conference championship games. The rest of his crew is made up of Carl Paganelli (umpire), Jim Mello (head linesman), Tom Symonette (line judge), Scott Steenson (field judge), Dave Wyant (side judge) and Steve Freeman (back judge). Paganelli worked with McAulay in Super Bowl XXXIX, one of four Super Bowls that Paganelli has officiated. Steenson will be working his second title game. So what are the officials doing to prepare this week? They actually start looking at game video on Tuesday, first at some of their own games during the season, and then some of Seattle and Denver. They have to prepare mentally and physically. 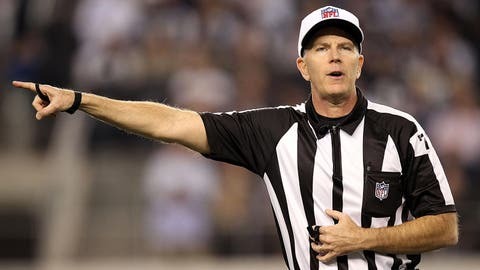 Referee Terry McAuley is working his third Super Bowl. That’s where the weather conditions come in. They are going to plan for the worst. Right now, the forecast calls for temperatures in the 30’s with occasional showers possible. But predicting the weather is like hitting the lotto. Good luck to the meteorologists this week, who must feel a little like the President, where people are hanging on their every word. Miserable conditions, however, are toughest on the officials. They are not like an offense or defense, meaning they don’t get time to leave the field to sit on the heated benches or stand next to a heater. They are on the field for nearly an hour and a half without a break. And if the conditions are awful, like they were in the Green Bay-San Francisco game, where the wind chill hit 20-below-zero, it makes it very hard to concentrate. But as we saw in Green Bay, that game was probably the loosest officiated game of the playoffs so far. In order to keep their minds sharp, they need to do their best to stay warm. So what do they wear? Wetsuits, believe it or not. They wore them in Green Bay to trap the heat. Then they’ll add layer upon layer. They have ski masks, head gaiters that go over their ears and face. They put so much on that even Ed Hochuli was unrecognizable in Green Bay. This crew has got to get themselves mentally prepared to get back on the field after a three-week break and they are going to have to get physically ready by getting all the stuff together before they head to New York on Thursday. Once they hit the ground here, it’s social days for them on Thursday and Friday. Thursday, the league hosts a dinner for them and their families. Friday they are on their own and at that point the officials start to study as a group. Then on Saturday, crew meetings could last most of the day, as they watch video and study the rules. Some might wonder why their families are with them. This game is no different for them as it is the players. The Super Bowl is the ultimate reward. All the effort that the officials put in during the season culminates with the honor of working the Super Bowl. It means you are the best of the best. Besides the honor, what does it get them? Some might say money, but the money is not a factor. Just like the players, just like the teams … it’s about the ring. The Super Bowl ring. The officials get Super Bowl rings just like the players do. They aren’t as big as the players’ rings, but they are still valuable pieces of jewelry. 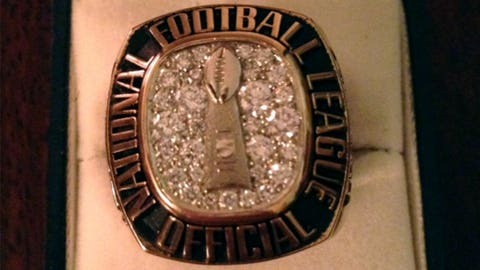 These rings mean the world to the officials and they wear them with such pride. I know from time as the VP of Officiating for the NFL that the referees get stopped by people who see their rings and ask if it’s a Super Bowl ring. The pride comes from within the officiating industry, because people know that these guys have officiated the biggest game of the year. When Sunday night is over, I hope we hear nothing about the officiating. If that’s the case, then the nothingness will carry on through the off season. And that sound of nothingness would speak volumes.